Okay, after my using the book as a good example in my post on Surpassing Conventions, you can probably guess what I'm going to say about this book! But anyway, here goes: my review. Brynd, meanwhile, has the task of making the city ready for war. With the city's gangs uncertain allies, and his own personal habits discovered, it's an unenviable task. Meanwhile, outside the city, Eir, and Rika - members of the royal family ousted following a coup - are pursued by the Empire's soldiers, with Randur aiding their escape. Newton tackles the familiar event of a siege very well: social as well as military tensions grow, and within the city, there's no overwhelming 'banding together in the face of adversity' mentality which we've grown to expect. Although there was somewhat of a 'New Weird' feel to Nights of Villjamur, it's in the city of Villiren - with its conflicted citizenry - that we really get the Mieville-esque nature of Newton's story, and cultists' magic becomes much more atmospheric. (I would argue that it's overused as conflict resolution in certain sections of the books). Characterisation is also a lot better. Eir and Randur's relationship, which was one of my complaints in Nights, is far superior: it's now much more covert (her sister is there, after all) and more believable. We're also led to a lot more empathy for characters such as Brynd, which previously seemed to play only a plot-relevant, rather than thematic role in the book. (Although I do think Lutto, the corrupt reeve, disappearing halfway through the story lost the book one of its more interesting characters). Beware, though - there are no author's darlings here! Characters suffer the consequences of their actions - or beyond them with impunity, and though it's no A Storm of Swords yet... There's definitely an 'anyone can die' feel to the book which definitely adds to the tension! There's no safety net of 'oh, x won't be killed off': because x very well might be. Then brutally dismembered for added drama, and sold as meat. That really wasn't a spoiler, you know. All in all, any flaws in City of Ruin are minor, and we're definitely seeing this fantasy as more than the norm: the arrival of an invading race, the ongoing ice age, and a plea to the usurped Empress Rika that I really won't spoil... All combine to make the third book one that I'll definitely be looking out for. 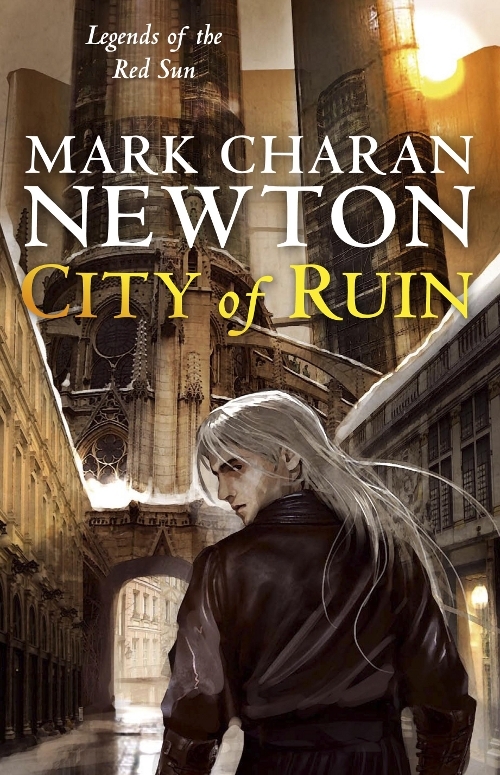 Mark Charan Newton has reached a stage of brutal genius, and I can't wait to read more! Read this book yourself, or just have something to say - or a suggestion? Comment below and tell me! been hearing tons of good stuff about Mark Charan Newton, and I'm very intersted in his newest title, Book of Transformations, but I suppose I should start with Nights of Villjamur? Yes, Nights is the first book, but I'd recommend reading it more as a prelude to the main series: City of Ruin is a much, much better book, to match (by the sound of it!) The Book of Transformations. Nights focuses less on the series' more interesting premises and goes for slightly well-done political intrigue - which, while fine, kind of disappoints slightly.